EXTREME: Some climbers passing through one of the most dangerous stages. A DEATH-TRAP walkway which has gained world wide notoriety on YouTube has been pinpointed as a crucial tourism hotspot for the area. 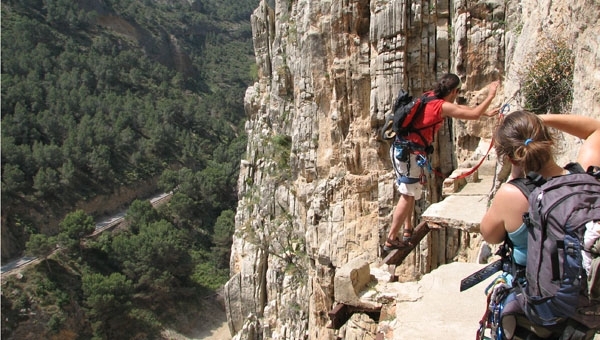 The 100-metre high Caminito del Rey walkway clinging to the side of the El Chorro gorge features in scores of home-made videos posted on the internet site. They show daring climbers braving the perilous path, at times walking on narrow iron beams with nothing but fresh air between them and a 100 metre fall. Known for its extreme danger, four people have died at Caminito del Rey in the past four years trying to climb the gorge, even though it had been closed to the public since 2000. Now Andalucian Board of Tourism councillor Rafael Rodriguez is asking the Malaga provincial government to cooperate with his department. He wants to carry out urgent renovation of the crumbling attraction, tagged by many as ‘the most dangerous trail in the world’ and ‘the Walkway of Death’. Rodriguez pointed out that the Caminito del Rey, if renovated, could easily become a major tourist attraction, along with sites in the area like the wetlands and the prehistoric caves in Ardales or the Bobastro Arab-era ruins. However, Rodriguez also claimed that it has now been 14 years since talks about restoring the 110-year-old Caminito were started. Last July, the announced plans to start work on a €5 million renovation were delayed. Malaga provincial government withdrew the €980,000 it had planned to provide.